Team Scotland very much hope to see as many as our supporters as possible at the above celebratory event. 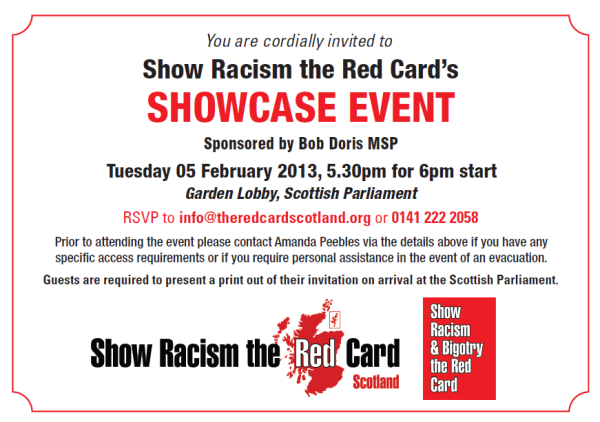 Show Racism the Red Card have many supporters in Scotland and unfortunately the event has limited capacity, therefore, spaces are available on a 'first come, first served basis', therefore, please confirm if you would like to attend asap, RSVP deadline is Tuesday 22 January 2012. Prior to attending the event please contact Amanda Peebles via the details above if you have any specific access requirements or if you require personal assistance in the event of an evacuation. Guests are required to present a print out of their invitation on arrival at the Scottish Parliament.